It’s National Get to Know Your Customers Day and we’ve been talking with you all week on our social media. It’s been great! We love getting to know you and interacting! We asked you what topics you want to read about on the blog, and DIY was your top pick. So we are bringing you something fun to do with BASKETS! 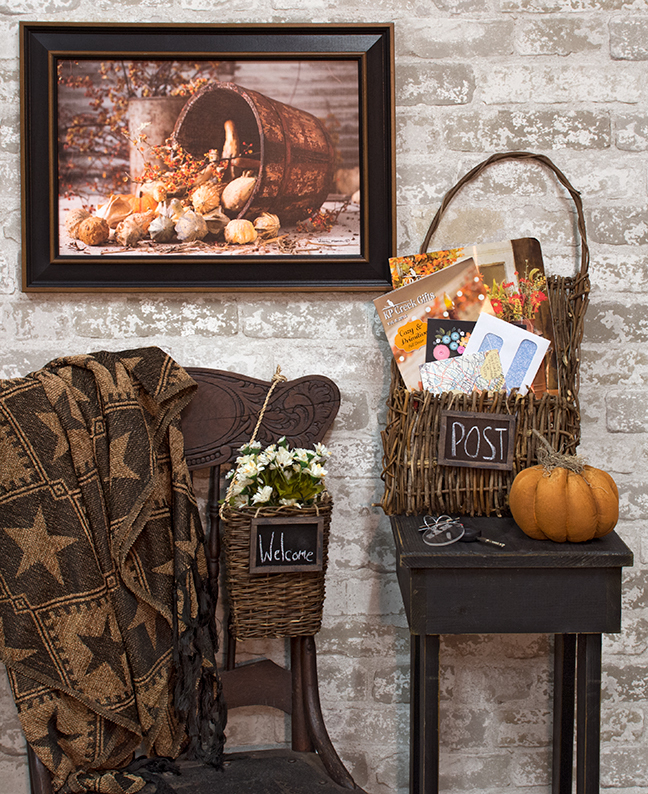 Let’s add some country charm to your entryway by using baskets in a way you might not have thought of before! Why fall and not summer? Well, we’ve been working on autumn catalogs so we are slightly obsessed with all things fall! When you hear the word “basket,” you probably picture a traditional picnic style basket. It’s kind of surprising how many styles of baskets there are, not to mention all the uses. Just ask our Pinterest board! They aren’t just for hiding away random clutter anymore, they can be spruced up and become a focal point of your decor. Both of these looks are under $20 each! We picked two different styles of vine baskets: a vine pocket and a hanging vine. Our initial thought was to just fill both of them with beautiful fall florals and call it a day! But where is the fun in that? Post baskets have become increasingly popular, so we wanted to create one. We hung a small chalkboard from the vines of our vine pocket basket and wrote “POST.” Mail and catalogs fit perfectly in the pocket and it’s such a cute place to collect your mail once you bring it in. Don’t be like some of us with random piles of it all over the house! Get this look for only $19.98 before tax! Look #2 with the small hanging basket is a friendly welcome for your guests! We used another little chalkboard to add a “WELCOME” message, and we filled it with cream daisies! To add this look to your home, it will only be $15.28 before tax! GIVEAWAY IS CLOSED (July 21,2017) thank you all for entering! Comment below on what you love about this DIY, and/or what you love about fall, and get an extra entry to win the Barrel of Gourds print! Visit our Facebook page: facebook.com/kpcreekgifts/. Find the post with the blog link, like/love it, and tag a friend who loves DIY! Facebook is where we will also announce the winner on July 21, 2017! The Barrel of Gourds print that you win is bigger than the one we sell! The one you can win measures 20″ high by 14½” wide (including frame). This print is a $50 value!! We appreciate you and know that everyone loves a good sale. So we have a special coupon for you! Use the coupon code below and get $10 off $40! 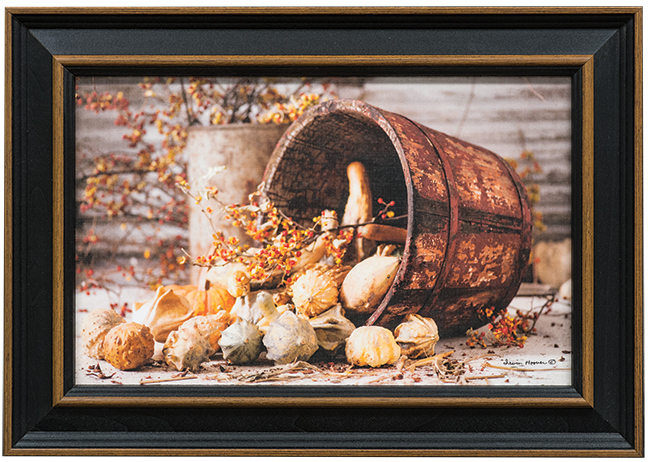 Other items photographed: Barrel of Gourds print ($31.99, this one that we sell is actually smaller than the one that is pictured), Jefferson Star Chenille Throw ($53.89), stuffed orange pumpkin ($9.99). Summer is typically my favorite season but autumn is really creeping in to take the number 1 spot! Fall is so fun campfires,pumpkins,hay bales and great friend gather together. Crisp cool air and beautiful scenery with all the amazing colors on the trees. Baskets are lovely and chalkboards make them even better. You are so right, Connie, ESPECIALLY about the colors! They are so warm and pretty! I am glad you like the baskets and chalkboards! Thank you Katherine! Fall is perfect! And just like you said, so many warm memories come with it! Yes! That is what I love about certain decor items. They can easily become a staple in your home and a few quick changes make it fit in with whatever season! Fall is my favorite season and I love decorating for Halloween 🙂 These ideas for before and after are beautiful! So beautiful. I love fall decorating. It’s so warm and cozy. Fall decor + country/primitive = the warmest and coziest!!! You have the cutest little mice to decorate with And everything is beautiful from y’all , really amd truly ! The little mice are so cute! Thank you!! LOVE to decorate for Fall and this gourd photo is GORGEOUS!! Thank you! We love sharing it with you all! I just love everything about fall. It’s my favorite season. This year my youngest daughter is getting married, in our yard, on the first day of Fall. What could be better?!?! Oh wow, what a memorable fall your family is going to have!!! Congratulations to your daughter from all of us here at KP Creek!! Fall is my favorite time of year! Decorating for it makes my house so cozy! I love country primitives and KP Creek! Love all of your decorating ideas!!! Thank you Tiffoni!! It is so fun to come up with the ideas! Let us know if there is something you would love to see! Fall is my favorite time of year. I have ordered several fall items over the years from KP Creek and have always loved my items. Autumn is my favorite time year – love, love, love!!! Autumn is my favorite time of year and I love all these wonderful decorating ideas. Just entered your giveaway! Thank you so much for entering! I love fall too! More and more since working here because the fall decor items are great! I will be sure to keep the decorating ideas coming here on the blog! Looks so warm & welcoming to the season, and would to all the visitor’s & family as well. It will definitely be eye-catching to all your guests! Good luck! We will post the winner tomorrow on facebook! Thank you so much for this great blog and awesome items at KP Creek! How sweet! Thank you so much for reading! I really enjoy coming up with ideas to share with everyone! Decorating is so fun! Good luck! We will post the winner on Facebook tomorrow! Love love love the basket with daisies!!! It’s so simple and perfect!! I own so many of your wonderful primitive items and this vine basket is going on my list. I really like the styling and great idea to Use for mail! Your ideas are not only awesome, but cost effective too. By that I mean I can purchase different items from your shop and all are priced very reasonably. The quality is first rate and that I really appreciate! Yes! We love that everything is so affordable, especially both of these baskets here with the extras! And don’t forget, we have a coupon code right now too! It is listed at the bottom of the post, $10 off $40!! Fall is my favorite time of year! Love all the great ideas you shared! I am so glad you love it Heather! They are so fun to put together. Good luck on the contest! I’m so excited for fall!! My favorite season!! That hanging basket would go perfect by my door! Summer is usually my favorite season but it’s just been too hot. And seeing all the great decor coming in here at KP, fall just might become my favorite too!! One of my favorite places to shop!!! Love your country decor products! Fall is my favorite season!! Thanks Brandy! We are getting in SO many great fall items. You are going to want to buy up the whole catalog that comes out in August! Love all KP Creek! Been shopping with them for years! Thanks for being such a great and loyal customer Patricia! Fall is my favorite time of year and I work for the post office so I just love the post basket. Everybody gets mail!! Have you seen any decorative post boxes like this on your route?! I really love the rustic look! The picture is beautiful and the baskets are so cute!!! Thanks Deb! It was so fun to put together! Enjoyed chatting with you on Facebook. All who love your products are connected mind, heart and soul in that we appreciate the warm comfortable environment your products create in our homes. Thank you! Thank you Mary! What a sweet and beautiful thing to say! We appreciate you so much as a customer and glad our products can be part of your home and memories! Love, Love, Love your , products ! Yay! Thanks Dora! 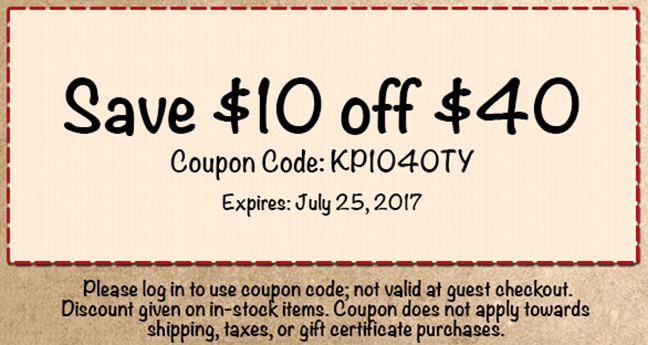 I am sure that you can put that $10 off $40 coupon to good use! So glad to hear you love the catalog! It really is so beautiful with great pictures of the products! Fall decorating is so fun! Absolutely love all ! Your products ! Thank you so much! There are sooooo many great things!